Well, I say basic… You can find out what it contains after the gallery. The first thing to say is that this is not a “must-have” list or even necessarily a blueprint for assembling your own travelling coffee kit. Not everyone is as obsessive about good coffee as I am. However, it might give you some pointers. So, without further ado, here’s what I regularly take with me, in some sort of order of importance. Let’s start with making coffee. Unless you know you’re going somewhere with good coffee-making equipment, you’re going to need to bring your own kit. Even when I know I’m going to a friend’s house where there’s cafetiere, I’ll pack my Aeropress. Relatively small, light and practically indestructible, the Aeropress is the ideal travelling companion. It’s also relatively quick, fairly intolerant to variations in things like grind-size, etc, and it’s easy to clean which is quite important when you’re worried about disposing of the coffee grounds at the end of the day. There are two main issues with the Aeropress. The first is that it can be fiddly, needing a flat, solid surface to plunge it on. That’s the main reason why I no longer take it on planes with me. The second is that unless you use a metal filter, you need to remember to pack the paper filters. I’ve got around this by popping some spares in a zip-lock bag that sits in my rucksack (it’s a rare trip when I go somewhere without my rucksack) so I’ve always go an emergency supply. My second weapon of choice is the Travel Press, a cafetiere-like device which often accompanies my Aeropress. It’s similarly small and indestructible, although it’s a little heavier. It has the advantage of keeping the coffee hot for several hours, so when I’m in meetings with bad coffee, I can make up a Travel Press in my hotel and bring it with me. Less fussy folk might want to invest in a small thermos instead. 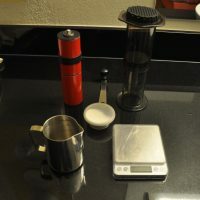 It’s easier to use on planes and trains than the Aeropress, so it often makes it into my bag for long-haul flights, but it’s a more difficult clean as you need a sink and running water. Having clogged up more than one sink with the grinds, I’ll often flush them down the toilet. You might think if I’m taking the Travel Press, why take the Aeropress too? Well, the answer is relatively simple: taste. At home, I use my cafetiere first thing in the morning with something relatively bold and unsubtle (think a good espresso blend), while in the afternoons, I use my Aeropress with something lighter and more delicate (think a nice, single-origin filter). So it is when I travel. The final option is a large cafetiere. This will very much depend on circumstance, but in the last couple of years, I have made a name for myself as the man with the good coffee, so people naturally turn up expecting good coffee. While I’m happy to make it for them, having had the experience two years ago of trying to make coffee for four people with just an Aeropress, I’ve come to realise the value of a large cafetiere. I have a metal one in the UK that comes with me once or twice a year, usually when I have a car, but it can sneak into my big rucksack if it has to. Similarly, I have a large Perspex one in the US, which I bought the same day that I made five cups of coffee with my Aeropress. This now lives with a friend of mine and turns up at social gatherings over there. What about the rest of the kit? Well, if you are prepared to live with pre-ground coffee, then maybe that’s it. However, you won’t be surprised to learn that I’m not, so I always travel with a grinder. For a while, this was my bright red feldfarb, but recently I took delivery of a brand new Aergrind, Knock’s latest grinder, designed specifically for travel. I make no secret of my love for Knock’s grinders. In terms of value for money, I think that they are the best hand grinders on the market. Prior owning my Knocks (I also have a wooden feldgrind which I use at home), I used a ceramic burr hand grinder which was good as far as it went. The main drawback was that neither of the ceramic grinders (yes, I had two) were that easy to adjust. Now I’ll readily admit that if you are travelling with just a single method of making your coffee (say an Aeropress) then this is less of an issue, but as soon as you start switching between methods, it becomes a real pain. In fact, as an alternative to getting the Knock, I was actively considering travelling with both ceramic grinders, one set up for Aeropress and one for cafetiere. Which would have been a pain. The other big piece of kit is a pair of scales. I realise that this is another thing I’ve not really written about, but to put it simply, I would not be without my scales. At home I have a very fancy set of Bonavita auto-tare scales, and while I’ve tried travelling with them, they are bulky and I worry about them getting damaged. Instead a have a rather battered set of On Balance Envy scales, which I find a good compromise. For starters, they are about one-third of the cost of my fancy scales and while they don’t have a built-in timer, they are relatively robust and weigh up to 2kg, with a resolution of 0.1g. If all you are ever doing is weighing coffee, then you can probably get away with an even smaller set, but these usually only weigh up to 500g and since I like to weigh my water as well (I know, I know…) they’re not really suitable. Something else I would recommend travelling with is a good, metal jug. Although not essential, it can be very handy to have something reliable to pour water with (not such an issue is you have a kettle, more important if you are having to heat your water up in a mug in a microwave) and also to set under your Aeropress. Also a little bulky, it’s again relatively light. Finally, I’d recommend a decent, reusable cup. Frankly, I feel you should have one anyway, but if you are planning to make coffee on the move, then a good cup is essential. The other optional thing you might want to consider is a kettle. Although I have a couple of travel kettles, I rarely travel with them since they are quite bulky. However, if you know you’re going to need a way of heating up water, it’s worth the investment. Once, while travelling the US, I stayed in a motel with no kettle, hob or microwave. I was so frustrated that I bought a kettle which is now part of the same US travel kit as the cafetiere. For a compact, light-weight alternative to carrying a kettle around with you, try this article by Brewing Coffee Manually. A kettle is also worth investing in if you know you’re going to be in a hotel where the only source of hot water is a one-cup coffee making machine. Again, that’s fine if you’re making coffee for just one, but as soon as it goes beyond that, a kettle is a great investment! The final consideration is the coffee. Naturally, I take whole beans with me, usually three different types (one for use in my cafetiere/Travel Press, one for use in the Aeropress and one decaf). If I’m away for a long trip, I’ll take actual bags of beans, but if I’m only going for a short trip, I have a variety of small, airtight containers which hold around 90g of beans, good for a weekend away. Of course, depending on the trip, I will also buy beans while I’m there. I also have a series of smaller, 15g containers that I use on planes and trains having learnt, to my cost, that scales don’t work on vibrating surfaces! So, in preparation for a long journey where I’ll be making coffee en-route, I’ll pre-weigh all the beans I’m going to use and put them in these small containers. This has the added advantage of being able to put my bags of beans in my hold luggage if I’m flying. Trust me: taking bags of coffee through security at airport can lead to delays: one TSA agent at Miami airport was great amused as she went through each of my bags of coffee and I told her where the beans were from, who’d roasted it and where I’d bought it! I’ll close with a note about the water. This varies hugely and has a massive impact on your coffee. At home, I use a water filter, while when I’m staying at my Dad’s, I’ll use bottled water. If you’re travelling and your coffee is tasting off, the first thing to do is look at the water. My recommendation is to try the tap water first, but if that doesn’t work, just get some bottled water from the local supermarket. I’ve invariably found that the cheap stuff works really well! So, that’s it, my (not so) basic guide to my travelling coffee kit. I’d love to hear what you travel with, so feel free to leave a comment below! February 2018: if you liked this post, you can see what my travelling coffee kit and I get up to in Travels with my Coffee, Part I. March 2019: I’ve recently expanded my travelling coffee kit to include a collapsible filter cone and a gooseneck pouring jug.